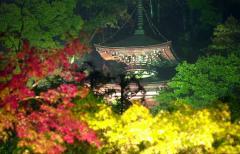 Known for its scarlet maple leaves, Eikando is the Jodo-shu Seizan Zenrin-ji School Head Temple. Founded by a disciple of Kobodaishi (Kukai) in the Heian period, It started out as a Zenrin-ji temple. The monk Yokan Risshi popularized the "nenbutsu" prayer to Amida Buddha, thus, it is said, the temple took the Chinese characters from his name. The temple is famous for its Amitabha statue looking back. With the wide-ranging backdrop of Higashiyama mountains, the temple grounds are filled with color throughout the seasons thanks to its many varied maples. As there are steps at the Chumon central gate, wheelchair users should use this entrance to enter. You will need permission to use this wheelchair friendly entrance; so, have a helper or someone ask for you at the admission booth or notify the temple in advance. To get to this special entrance, go through the Somon gate and head toward the Chumon central gate, the entrance is on your right just before the Chumon central gate. Head toward the entrance of the temple office and enter Shodo hall from the door on the left (photo). If you wish to worship in the hall, mention this to the staff at the admission booth, and the door will be opened for you. From the door to the lobby of the hall there is a slope. Once you reach the lobby, either change to a temple wheelchair or have someone wipe your tires. The hall is fully equipped with slopes, so an almost complete tour is possible. Once through the Shakado hall, with its beautiful partition paintings, you will find a lift in front of the Senbutsudo hall. Temple staff will assist you in the use of this lift. Next, head to the Goeido hall, which is dedicated to Honen Shonin, the founder of the sect. The doorsill at the entrance is a little high, so wheelchair users will probably have to view the interior from the corridor. At the rear of the corridor in the Goeido hall is an elevator. Take this to head to the Amidado hall. On the right side as you come out of the elevator is a slightly steep uphill slope leading to Amidado hall. To the left are steps leading to the Garyuro (reclining dragon corridor). But do not worry as there are vehicle stoppers in front of the steps to prevent accidents. The famed Mikaeri Amida statue is enshrined in this hall. Just like the Goeido hall, this hall has a slightly high doorsill, so wheelchair users will have to view the hall and its famed Amida statue from the corridor. In the garden, light seeps through the canopy provided by the Japanese maples, making this a relaxing place to stroll. From here the Tahoto (two-storied pagoda) and Shakado hall can be seen nestling in the green of Higashiyama.